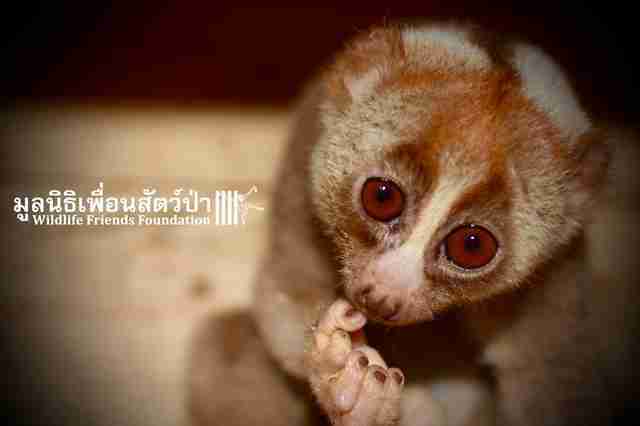 This little slow loris nearly lost everything - just so he could be someone's living plaything. Earlier this week, Wildlife Friends Foundation Thailand (WFFT) received a call about a slow loris who was surrendered to a rescue group after a passerby "found" him on a beach - but, like many of WFFT's rescues, the story didn't quite add up. When the WFFT veterinary team finally examined the animal, who was later named Boris, it discovered the small primate was covered in ticks, and his wrist had been broken at some point. 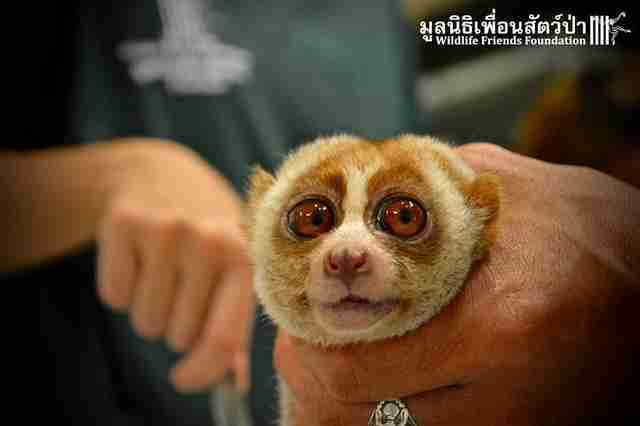 But perhaps most cruelly, his teeth had been painfully clipped out - a common fate for captive slow lorises. 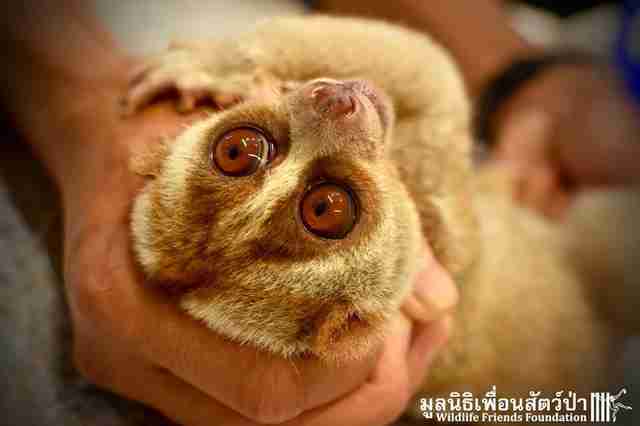 Because of their big eyes and cuddly appearance, slow lorises are highly sought after as exotic pets and tourist attractions, both in Thailand and internationally. But slow lorises happen to be the world's only venomous primate, and can use their sharp teeth to inflict a nasty bite. 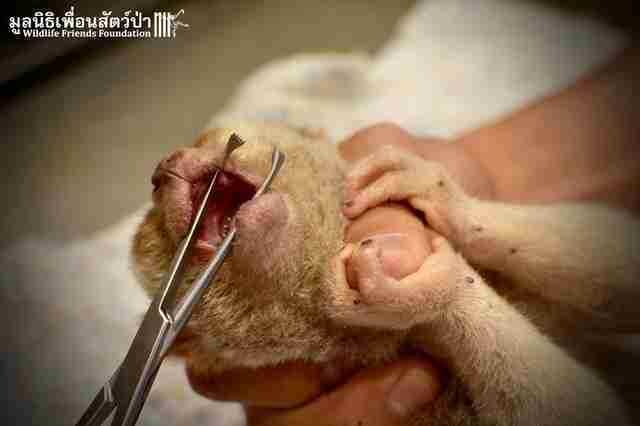 As a result, slow loris traders will often clip or pull their teeth out, a highly painful procedure that's done without pain relief and leaves the slow-moving animals devoid of their only natural defense - turning them into helpless teddy bears. 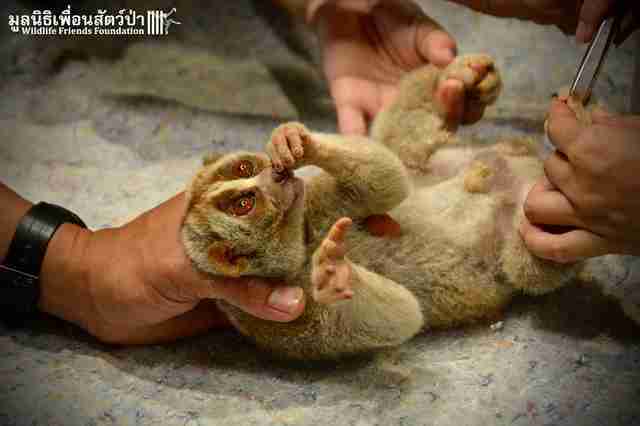 "Teeth clipping and extraction is common with captive lorises," WFFT wrote. "Particularly [with] those that are used illegally as photo prop animals, to prevent them from causing injuries to the people that pay money to get that all-so-great selfie with a wild animal in a far away, exotic place." Due to poaching and other demands, it said, the slow loris population has decreased by 30 percent in just three short generations. The group added that, because Boris turned up near Chaweng Beach on the island of Koh Samui - a hotspot for illegal wild animal selfies - he was likely a victim of the tourism trade. Boris' wrist injury possibly came from his capture as poachers often capture lorises using crude snares "that can maim and often kill them," WFFT said. "The sad reality for the animals embroiled in a life of abuse within the tourist photo prop industry, involves being taken from the wild, ripped away from their mothers, sometimes drugged, their body parts modified to suit the needs of tourists," the group said. "They spend endless nights being dragged around bright, loud, overpopulated and polluted areas." But, perhaps for the first time in his tortured life, Boris finally has reason to feel safe. Though he'll never be able to return to the wild due to his cruel teeth clipping, he'll live out his days in comfort at the Thailand sanctuary. "He will be able to climb in the trees, receive proper diet, mix with his own species, and never be handled by a tourist or a tourist tout ever again," WFFT wrote. "He now has some peace." If you'd like to help Boris and other animals like him, you can make a donation here.